Road rash is a common side effect of many motorcycle accidents. It happens when you fall off your bike, and your body (usually arms and legs) starts to scrape the pavement until you come to a complete stop. Even the best leather pants and personal gear will only protect you so much. If you’ve ever taken a spill while on your bike you know first-hand how painful and scary road rash can be. The good news is that it can be treated with simple over-the-counter medical supplies. We’re going to give you some tips on how you can treat road rash and be able to get back on your bike and ride again. If you’ve just had an accident, the first thing you want to do is make sure you’re alright. If you hit your head (even if you were wearing a helmet), you should call emergency services to examine you. If you didn’t hit your head and you think you didn’t break or sprain anything, you can turn your attention to the body part that’s scraped up. Take a look at the wound and check for bone, muscle, or anything that looks more severe than just a bad rash. If you notice injuries that seem to be above and beyond a simple road rash, you should call 911. Assuming that your abrasions did not penetrate through the layer of skin, you should be able to treat yourself. If you don’t have a first aid kit on your bike then you’ll need to head on over to the drugstore to buy some supplies such as gauze, bandages, hydrogen peroxide (to sterilize the wound), a water squirt bottle (to clean the wound), and some antiseptic such as Neosporin. You should clean the wound as soon as possible to lessen the chances of an infection setting in. Run some lukewarm water from a faucet and start to gently rinse off the body part that got scraped. Then try to disinfect it by pouring on some hydrogen peroxide. Keep in mind that it will most likely sting so prepare yourself for a mild shock. You can also put an ointment or cream such as Neosporin on top of the wound. This adds an extra layer of anti-bacterial protection in case dirt gets back inside or you didn’t clean the wound out good enough. Then apply some bandages. The first aid kit on your motorcycle should contain bandages and gauze of different sizes. Make sure they have some adhesive, or you have a way of securing the gauze to your body. If you’re far away from home or are going to continue to ride after your spill, an over-the-counter painkiller will work wonders in alleviating the residual sting from the wound. Medical professionals have three different classifications for road rash: first, second, and third degree. They refer to road rash as “friction burns,” and the severity can range from a mild scrape and bruised ego to life-threatening damage. If you’re able to treat the road rash on your own, chances are it’s not very severe. 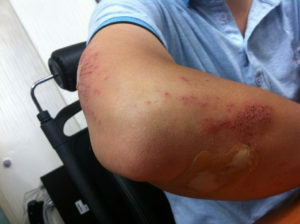 It should heal up in a few weeks provided that you change the bandages and keep the wound area clean. If you’ve been involved in a motorcycle accident and would like to speak to an attorney regarding your legal options, give us a call at (253) 472-6000. At Evergreen Motorcycle Attorneys, we’re just as passionate about motorcycles as you are. Many of our attorneys are life-long riders and can help you get the justice that you deserve.